Taxonomy: There are 14 subspecies in the native Eurasian range (Clements et al 2016). Comments: Several attempts were made to establish this species in Nebraska with the releases between 1938 and 1943 of about 6500 birds, but these were unsuccessful, possibly due to predation (Mathisen and Mathisen 1960, Halbert 1940). Ducey (1988) cited nesting reports from Logan, Madison, and Sheridan Cos in the 1940s. A notable release was of 700 birds in southern Scotts Bluff Co in 1969 (Johnsgard 1997); there were consistent reports from Scotts Bluff Co from this time until 1977, as well as a more recent report 19 Mar 1984 which was apparently derived from private releases made in the Robideaux Pass area 1981-84 (Cortelyou 1984). Five were photographed along Wright’s Gap Road in Banner Co 15 Feb 2014. A population apparently persisted for some time in the Sheridan Co sandhills (Johnsgard 1979), although none were seen after 1977 (Rosche 1982), and possibly on the Pine Ridge in the Fort Robinson area in the 1970s (Rosche 1982). One seen in southern Sioux Co 4 Apr 1998 was “probably part of a flock set free by a local rancher some years ago” (Helen Hughson, personal communication). Reports from Lincoln Co 8 Apr 1974, 14 Apr 1977, and 18 May 1986 are probably locally released birds for hunting or dog training purposes, as are reports from Douglas and Sarpy Cos 1963-65, Ralston, Douglas Co Mar 2001, Dodge Co 19 May 2000, and Nebraska City, Otoe Co in Jun 2003. A nest with eggs was photographed near Grand Island, Hall Co 9 Jun 2010. There is a possibility that a population might establish from released birds in suitable habitat such as the Panhandle or arid parts of southwest Nebraska. Photograph (top) of Chukars at Wright’s Gap Road, Banner Co 19 Feb 2014 by Marie Smith. Cortelyou, R.G. 1984. 1984 (Fifty-ninth) Spring Occurrence Report. NBR 52: 51-67. Halbert, D. 1940. 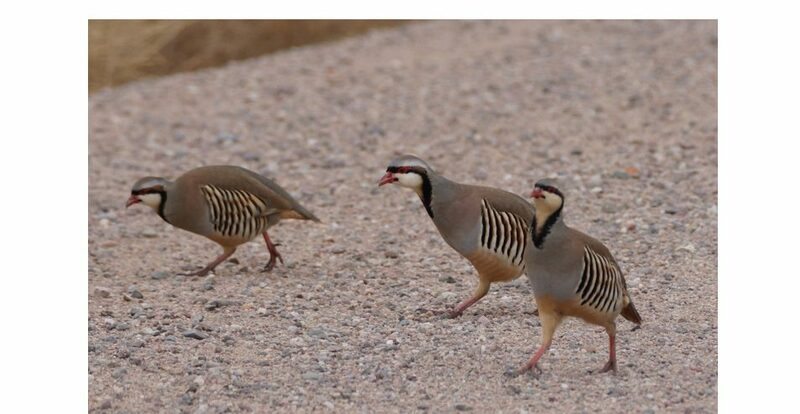 Notes on Nebraska-reared Chukar Partridges and Valley California Quail. NBR 8: 87-88.